Reichhold is one of the world's largest suppliers of unsaturated polyester resins for composites and a leading supplier of coating resins for a wide variety of markets and applications. With its world headquarters in Durham, North Carolina, USA, and 19 manufacturing sites (17 operated by Reichhold) and 5 technology centers located around the world, Reichhold has the widest global reach of any resin supplier today. With 1.300 employees worldwide, Reichhold has the global resources to provide innovative solutions to the needs of our customers: composites fabricators and coatings formulators. Meeting their needs and exceeding their expectations is our primary goal. As one of the world’s largest suppliers of unsaturated polyester and vinyl ester resins for composites applications, Reichhold is committed to being the preferred and responsible supplier of both conventional and speciality products to an increasingly diverse group of global customers. 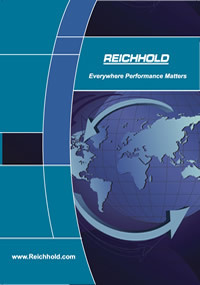 To serve these global customers, Reichhold has expanded into rapidly growing markets that include India and China. Reichhold is dedicated to providing our customers with the most innovative, highest quality value-added products and services possible. This is achieved by offering the broadest global manufacturing presence and a complete line of resin products, gelcoats and bonding pastes for a wide variety of composites end use applications. Five state-of-the-art Technology Centers located globally support Reichhold’s development of new materials for both advanced and conventional composites applications. For over 90 years, Reichhold has been a pioneer in creating innovative technologies to help coatings formulators meet their customers' most demanding applications. Reichhold supplies coatings resins across many market segments; from resins for producing low VOC architectural paints, to resins designed for the most demanding of high-performance industrial applications. Today, Reichhold is widely regarded as being one of the most innovative suppliers to the coatings industry through its continued investment in R&D, technical support and new product development. Reichhold supplies a wide range of product lines for a variety of markets and applications in the coatings industry. With technical and research facilities located around the world, innovation is combined with state-of-the-art manufacturing facilities and a sales and distribution network that is far reaching, enabling Reichhold to offer focused solutions for your needs. Reichhold’s core competence in a range of chemistries is unparalleled: alkyds, alkyd latex, polyesters, urethanes, epoxies and acrylics. *Reichhold does not market products under the BECKOSOL® trademark in Asia/ Pacific but equivalent products and technologies are instead sold under the REICHHOLD® trademark.